The manner in which rays migrate between upwellings, blooms and fish spawning in their planktivore ways has finally been investigated. Satellite surveys have been carried out on every major marine vertebrate except perhaps what is the most beautifully-shaped animal of them all, the manta ray. Certainly legions of manta fans will be relieved that another tool is in the box to claw back the remnants of the populations from extinction. IUCN has it red-listed but CITES still drags its feet, despite the loss of 2,400 per year to Indonesian fishermen. Rachel T. Graham of Exeter University and the WCS (Wildlife Conservation society) et al have prepared a paper in PLoS ONE which describes the satellite tracking using towed transmitting tags or telemetry to date. In real time, the enormous "batoid" devil fish, Manta birostris, has now been seen in the Gulf of Mexico to move in warm (>26.1°C) temperature zones, organise their foraging offshore in shallow areas <50m deep and use busy fishing lanes! (Above) Movements of manta rays in the western Caribbean and south-east Gulf of Mexico. 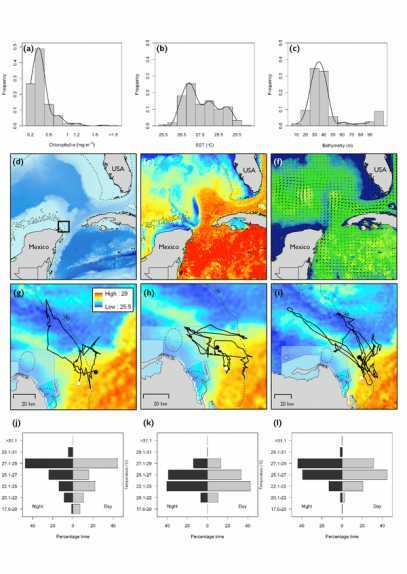 Frequency histograms of (a) bathymetry,(b)SST and (c) chlorophyll-α determined from the locations of all satellite tracked manta rays. Regional mapping of (d) bathymetry, (e) Sea surface temperature and (f) Chlorophyll-α imagery with geostrophic currents for 10th Oct 2010. (g-i) Tracks of three of the six manta rays (one female, one male and the juvenile manta ray, mantas 1, 5 and 6, Table 1) are shown with SST imagery (10th October). (j-l) Mean percentage time at temperature plots during night and day (temperature recorded by animal-borne tags) for the same individuals. 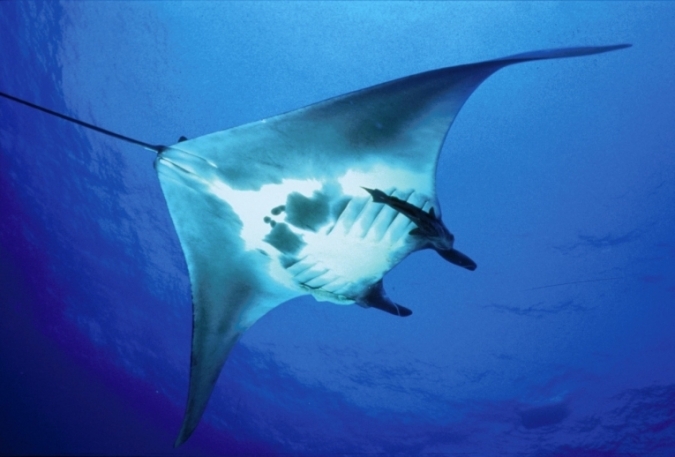 If the mantas do not migrate, then extended touristic activity could threaten the plankton and the fish themselves. This study could not establish if the mantas undertook long-range migration, even though distances of as much as 1151km were covered during the short (mean length of 27 day-coverage) experimental session. It's now essential that such migrations are checked, to see if the animal regularly leaves protected Mexican waters and ventures far into the Atlantic, just as it tends to migrate around the Australian continent.